Joel's Jottings: Coal India vs Reliance? Public verses Private Sector? 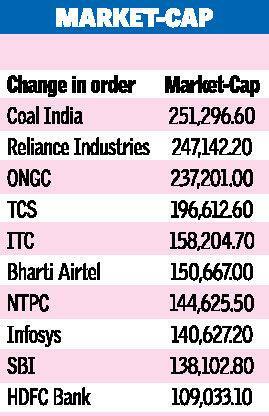 Coal India vs Reliance? Public verses Private Sector? I was excited to read the news that Coal India Limited (CIL) became India’s most valued firm this week - as the largest listed entity in terms of market capitalisation - overtaking Reliance Industries Limited (RIL) by Rs. 4,167 crores ( $ 913 mn). I was not excited because I own shares in CIL. No. I don’t. But I wish I did. The cause for my excitement is the furore the Indian media has been making on this news. Because, after four long years, finally, a government owned company, from the public sector, is back at the numero uno position. But for four years consistently, the private sector firm Reliance Industries Limited, led by Mukesh Ambani - the 9th richest man in the world, according to Forbes’ billionaire’s list of 2011 - held sway as the largest company in India fueling a good part of the nations’ economy. When the Market Capitalization figures on Bombay Stock Exchange showed, on the afternoon of Wednesday, 17 Aug, that the seemingly invincible private sector giant has been toppled from its number one position, it may have been a surprise to many. But it came as welcome news to those who brought CIL’s shares in its IPO of November 2010. We can see that the top three companies in India, as on Wednesday, are Coal India Ltd (CIL), Reliance Industries Ltd (RIL), and Oil and Natural Gas company (ONGC). All are Coal, Oil, Gas, or other Energy companies showing the strategic importance of these sectors to the growth of an economy. Following these three companies, on the same day, are these three private companies - TCS (Tata Consultancy Services), ITC and Bharti Airtel. And I found out that four out of the top six companies in India are privately held. So, what does this speak of India and its economy? What can we infer from this country where state-owned companies are struggling to gain and retain the top position? What can we say of a country where a private firm remains as the number one company for four years consistently? Either the government lacked strategy. Or that the government showed strategic excellence. But I believe that the government has shown excellence in planning. It’s prioritizing and allocating of even high earner sectors of Oil, Gas, Coal, Telecom, Software, Agro-products, Hotels and FMCGs, to private enterprises shows the futuristic vision of the Economists who foresaw value in liberalizing the economy this way. I believe that India has proven to the world that a vibrant private sector, that is well-run, can be a great asset to the country’s population. I feel that we must appreciate the way India has liberalized its economy, during the 1990s when the now Prime Minister Manmohan Singh had served as the Finance Minister, and initiated major economic reforms. I believe that if a private enterprise like RIL could be the number one company for four years, it is a clear proof of how liberal and how effectively privatized Indian economy is. Also, even though the state-owned Coal India is at number one position now, from the way the private sector is performing, I am somehow confident that It won’t be long before it loses that position.